Do you work for Google Slides? "Useful for presentations and work"
I really like the simplicity of this program. It is quite simple to use with the drive. I often work with different people in groups and we are able to collaborate with different slides and share ideas. The notes feature is really nice and people are able to leave comments with one another. The fonts and templates are nice also. I do not think that the templates are the nicest and I wish that there was more options to use as templates. I wish that the text box feature was better. I would recommend that people use this. It is free and easy and people can collaborate with one another to get all sorts of ideas. I think that this is a great option for people giving public presentations, or simply creating different options. We give quite a few presentations to large groups of people. Our headquarters sends out shared slides to everybody and when we go and speak about information at different public events, we use slides. "Google Slides, kostenlose Lösung für Folien"
Das Beste an der Anwendung ist, dass wir als Cloud-App mit anderen Mitgliedern der Gruppe zusammenarbeiten können, um die Arbeit zu beschleunigen und unsere Arbeit von jedem Gerät, Mobiltelefon, Tablet oder Computer aus zu erledigen. Die Anwendung ist Teil von Google Suite. Daher können wir sie über unser E-Mail-Konto (GMAIL) verwenden, um eine Verbindung zu anderen Diensten herzustellen, die zusätzliche Funktionen bieten können, wie dies bei Google Drive der Fall ist, mit dem wir die von Google Slides erstellten Dokumente speichern können, um dies zu vermeiden Das Ergebnis unserer Arbeit muss auf einem physischen Gerät gespeichert werden. Auf diese Weise können wir unsere Arbeit auch einfach mit einem einzigen Link teilen. Es ist auch möglich, Foliendokumente zu erstellen, die Bilder, Text und sogar Audio und Video (einschließlich Youtube-Videos) enthalten. Über die Benutzeroberfläche erhalten wir den klassischen Google in all seinen Produkten, die auf "angle" basieren, sodass wir eine einfache und intuitive Benutzeroberfläche sehen, die wir problemlos verwenden können. Ich denke, es muss noch ein bisschen technisch verbessert werden, um seine Funktionen an die gleichen anzupassen, die beispielsweise in Powerpoint angeboten werden. Obwohl es sich um eine Cloud-Anwendung handelt, wenn Sie Desktop-Anwendungen vollständig ersetzen möchten, müssen Sie dennoch ein wenig verbessern und die Probleme mit der verbindlichen Verbindung lösen. Diese Anwendung funktioniert sehr gut und die Ergebnisse sind sehr professionell, daher empfehle ich sie nicht nur für das schulische Umfeld, in dem es sehr gut ist, Arbeit zu präsentieren, sondern auch für die Arbeit, da sie das problemlose Teilen von Dokumenten und das Arbeiten in Teams ermöglicht, da dies keine Kosten verursacht komplette Office-Suite ist kostenlos. Bei der Arbeit finden wir es sehr nützlich, mit Folien von Google Slides zu arbeiten, da wir Dokumente mit sehr professionellen Ergebnissen in sehr kurzer Zeit anbieten können, da das Erstellen und Hinzufügen von Inhalten sehr einfach ist, sodass wir viel Zeit bei Desktop-Anwendungen sparen. Google Slides is an excellent apparatus in our versatile world.I can make a report on my computer and don't stress about having it backed up because it's all saved on Google Drive. I can open it up on my portable workstation and after that at the same time have it open on my phone making alters there too. It is extraordinary to work on reports together and collaborate with others. I cherish that you effectively flip back to a past form and reestablish it on the off chance that required. It's very easy to find out who made which alter which makes it excellent for checking on your team's work. I miss a few features available in a competitive solution I can not, for example, set the display time of the slide in the presentation. If you are looking for a solution that will enable you to create an online presentation, you should consider trying Google Slides. By using Google Slides, I can create presentations that are available online. "Make your imagination fly when creating successful presentations with Google Slides." It is the tool that facilitates me to create ideal presentations through the web, I can edit images with texts, add photos, sounds, videos, to make the slides more intuitive, I can make an excellent presentation at any time I want. It is good, but I do not like that when inserting many animations in the slides it makes the public distract, I also do not like that it is only through the web I can make the slides, since it is obligatory to have access to Internet, and many times I do not have the connection. 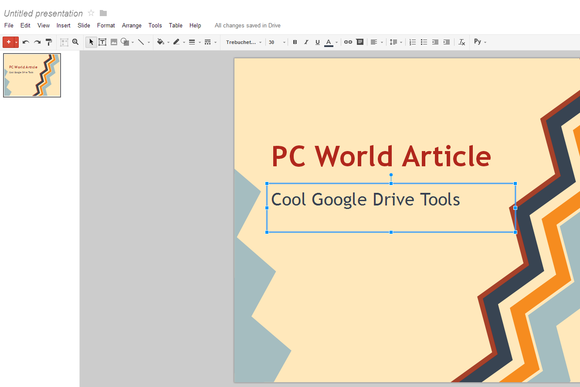 If you are looking for an ideal program that allows you to create extraordinary presentations and that offers a variety of functions, use Google Slides, it is good, unique and free to work on it. It is very good to work in the office or elsewhere, I can make a presentation quickly, share it with my colleagues, it is simple and I do not pay to use it. "Google Slides Makes Presentations both easier and better in the workplace!" I love that Google Slides makes sharing presentations easy! Multiple people can edit and view the presentation. It makes it easy for multiple people to be able to work on the same project and includes most of the same features as PowerPoint. It is also so nice that you can work on your presentation or present it from any computer. You don't need to worry about emailing it anywhere, you can simply log into your google account and it will always be there ready for you to pick up right where you left off! Also, no need to every press the save button as it saves automatically! The only thing I dislike about google slides is if you ever do convert it to PowerPoint, sometimes the formatting does not save the same. PowerPoint still has more features, but Google Slides is constantly updating and I'm sure will surpass Microsoft. We are solving the problem of multiple people being able to take on the task of a project ensuring it is perfect prior to the presentation. I like that multiple people can edit it at once and communicate through GoogleSlides itself. It makes group projects very easy and user friendly so you don't necessarily have to schedule a meeting to work on the presentation itself. "Many times we work from home, thanks to this powerful tool. " When you work for a company and you have to share with a group of people, it is always good to know how to use technology in your favor. Google Slides is a program that has allowed us to make online presentations, which we use to present our clients with information about our company. When we are about to close a deal with a client, we use this online tool and we show you information about the company where the client can see what we do. Our team has access to these presentations and can edit them through the web. This has helped us a lot to save time and be more efficient in our work. Many times we work from home, thanks to this powerful tool. If you want to be successful in the corporate world, you should make the client feel good. The technological world has many online tools that allow you to share with all the clients you have and this program is one of those. Use it to your advantage. "A slide platform that's capable of creating really nice presentations"
Google Slides has a good balance between simplicity and versatility. For those that want straightforward slide presentation without many bells and whistles, then Google Slides is a good fit for that. It also has enough editing tools to give users rooms to place objects and text in specific locations. The modification tools are intuitive and work similarly to basic text and image editing tools that most people can use. Google Slides doesn't have the extensive user interaction metrics that many leading slide presentation platforms have. It would be great if there were more live interactive features that could give us more insight into how well our presentations are performing in terms of audience engagement. If there's a way to do that in a highly detailed way, whether by default or through extensions, I haven't been able to figure it out. Google Slides can be a great tool since it's accessible through your Google account on any computer. Instead of having to lug around a file on one device or email the presentation around, you can store your presentation online and even collaborate with your team within the project file. When we need presentations done, I can count on Google Slides to deliver a quality presentation with minimal effort and technical skills. As long as we have nice charts and other images, I think it doesn't take much for us to produce captivating presentations. Google Slides is versatile in the types of presentations we can produce. I can simply start out with a template or design a new presentation from scratch with simple editing tools. "Visual presentation from the comfort of your web browser"
Just as everything you look for in a tool is a relationship between quality and price in this we obtain a tool of excellent quality for a null price, that is to say totally free, it really is a tool with which we can easily manufacture our presentations either to expose results, present new projects or simply the organization of information in the slides, also allows you to work in simultaneous team which is quite beneficial when it comes to need to develop a group presentation, also has direct integration with Google Drive that You can share our presentations with certain people. Another positive thing is that it allows us to edit not only create. Really if I had to complain about something serious that the resulting presentations can be somewhat simple, but sometimes in the simple lies elegance, in my particular case are simple presentations because in them I show data or submit projects without major complications which Nowadays, every time it becomes more fashionable. I recommend it to any person really there is nothing to lose by using it because it offers everything a desktop tool can but for free which is very positive, in addition to its mobile applications are excellent and can be used in the form of a viewer. I have been useful for the creation of presentation including its mobile application is incredible and useful, very simple to use, even the best I have used at the mobile level, I think a tool that is useful for anyone from students to professionals and with which can be counted without the need for monetary investmentt. "Google Slides for the Classroom"
The most helpful part of using Google Slides is the ability to collaborate. I can share my work with a group member or colleague and we can work on creating the slideshow together. Added benefits of using Google Slides have been the ability to watch presentations change and grow. If I forget something, I can add it to the Presentation and that change is instantly communicated with everyone that I've shared my work with. I wish that there were more premade backgrounds for Google Slides, or at least an easier way to download and keep them for further use. Coming from someone who was so used to working with Powerpoint, I wish that the text would automatically resize itself when you reach the edge of a slide. With Google Slides, you have to resize the text yourself or it will fall off the edge of the presentation slide. Do you work more with others than by yourself? If you work in teams and frequently collaborate, Google Slides will be good for you. I am finding that it is so much easier to collaborate with Google Slides. I have also found them to be an effective tool for leading instruction in my classroom. I can share a presentation with my students and it can be a living, changing document throughout the teaching unit. Google Slides may be an incredible device to collaborate on introductions. It is simple to utilize, and as long as you and your colleagues have a mail facilitated by Google or a free Gmail account, all of you'll be able easily to collaborate on it. The real-time alters fantastic in spite of the fact that I have found now and then when numerous individuals are working on a slide at the same time, there are in some cases a few investment funds issues. In any case, the auto-save is extraordinary, not having a fear of inadvertently closing the window and losing your advance. There are premade layouts that can grant your introduction a proficient see to it, indeed on the off chance that you aren't comfortable with making your possess. This makes it clean and straightforward. Another include I like around Google Slides is the speaker notes. This permits you to have your data, visuals, etc. shown whereas you'll have your possess notes that the gathering of people does not see. At last, a awesome way to dodge disarray when working together is the chat which permits all donors. One of the drawbacks I noticed when using Google Slides is that we can't continue working on a file if I don't have Internet access. If you are looking for a platform that will allow you to collaborate on presentations, you should consider trying Google Slides right now. Thanks to the use of Google Slides I can create presentations with team members for free. "Slide presentations with Google Slide"
What I like most about Google Slide is its ability to create professional documents for work and also for personal use. In addition, the application has synchronization of devices in those places where you have started the session with the same email account. 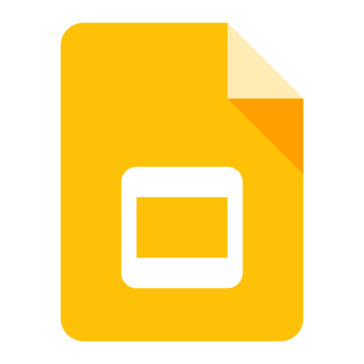 Google Slide works as an application in the cloud so that the documents created can be saved in Google Drive and even shared with other people through a URL link that we can indicate as modifiable or only read so that other people can view and modify its content. To complete the application is completely free, like most applications created by Google so it can be used as a professional tool at work without any additional cost. -The application works very well and I have not found any flaw to put but it is worrying that most TOP applications are being developed by Google since they have virtually no competition in their products. -The obligation to use a gmail account to enjoy the service, being an application that does not need any type of registration in a mandatory way. I recommend you use the service linking an email account so you can enjoy the application on all your devices. You can also share the document with your email contacts in a simple and fast way. I also recommend that you use the templates that come by default to improve the professionalism of your slides with little effort. I can make presentations for my business for free without resorting to paid office suites like Microsoft, plus I can use the application on all my devices with just my Google account. The ease of creating slide documents thanks to their templates saves me a lot of time. Google Slides may be a awesome stage, characterized by the truth that it is completely free. To utilize it you'll not require any establishment, fair that we have a Google account. Google Slides is very simple to utilize, we'll rapidly acclimatize its operation. We will make slides at will, A enormous advantage is the plausibility of a quick and trouble-free slide show. A extraordinary reward is that able to make interesting URLs so that we will make a brief one, easy to keep in mind address. -To create an offline introduction, you would like to download a duplicate of the presentation. -If we don't have get to to the Web, we'll not be able to alter our presentation. On the off chance that you're a individual who works in a gather on introductions, Google Slides will be for you a great solution. Especially that you simply can have get to to the show from anywhere. The benefit is free of charge, exceptionally simple to use. My group is able to work with the most extreme of Efficiency. We are ready to spare time on the exchange of presentation because everything is naturally spared on Google Drive. "Google slide saved my work!" Every day in my work environment, various tasks are presented, from sales reports presentations, proposals, support meetings and by recommendation of a friend, go to Google Slide and it has been the best thing that has happened to all the colleagues in the department of analysts If there is something I love about Google Slide, it is free, it does not require any paid license that limits you to work, it is compact, quite subtle with its tools and easy to adapt. They are similar to the rest of Google's tools. It is very familiar to use it. , you can access the cloud to take files and I can even access my phone without needing internet to edit the file you need. It's too useful and professional, Google Slide is the best of its kind. I would like to have more alternatives when creating my prints, however I do not complain about what it offers. Free, Compact, Access to the cloud and you can use it offline from your smart phone, I recommend it 100% to all users who want to experience, they will not regret it, I assure you. We can create our presentations without having to pay for any software, it has been ideal for the monthly and annual sales reports, we also use it for the expocision of the results of the analyzes carried out in the company, every time we are the ones that use it and it is a lot of work that facilitates us. The best part about google slides is the ability to collaborate with others. When working on group presentations, Google Slides allows the members to contribute to the document from any device. Another great attribute of the software is that you have the ability to add to the document from any where. Whether it be on a laptop, desktop, or phone. Similar software limits the users to one device which can cause complications. I do not like the limited template options. I feel as if they are all boring or too busy, there is no in between. Another draw back is the occasional freezing of the software when logged onto the internet which can cause frustrations. A huge business problem that google slides has solved for me is collaboration. As I mentioned because, this software allows multiple individuals to contribute, edit and present the document from any domain that they may be using. It is so great to have this on the go with you whenever you may need to reference it. "Being able to view and edit on mobile is a great feature"
I like that there is an accompanying Google Slides Android mobile application, so I can make quick changes to a presentation on the move. I recently used this on the way to a client. As with all Google products, I question the privacy issues in giving them access to all your data, especially as they have no way to contact them and they have had breaches in the past that they have covered up. Consider the privacy implications of Google. I use Google Slides to make animated video presentations to show to clients. I make lots of pages, which it transitions between, and I can talk and present the information as they are displayed. There are lots of fonts, colours and styles available, which I can use to make it have more visual impact. Although I am weary of Google products, I use this one and it is a good product. The ease of coordination and syncing with Google Slides puts it above it's competitors like Powerpoint. Powerpoint, at this point, is so antiquated, where as Slides is cutting edge. It allows you to all work on one presentation and make changes as you go along, rather than having to save it and close out before someone else can open it. Slides is also easily synced with presentation modes and other Google products, so it's a seamless transition as you're working. Honestly not much. Only thing we've found somewhat challenging is if someone's work firewall doesn't allow them access to Google Drive products. Then we have to save and send, rather than all working on it at the same time. This, however, is not a fault of the product, so I don't see it as a "dislike". Sort of the opposite of the above, for the clients that can access Google Drive, it's helped immensely to be able to work on projects in real time. There is much less confusion, as clients can provide real time input, as they are working through and reviewing items. "A smooth and efficient platform for producing presentations"
The collaborative tools really streamline the way me and my team work together. We can single out specific photos, text, videos and other content in our slides and work out issues right in the application. The Google Slides account portal has a minimal design that is very helpful to make me focus more on the content and work at hand. Signing up is easy and there are clear instructional materials to help new users figure things out. It's also pretty easy to find solutions to potential problems through online resources. Google is typically hard to get a hold of when it comes to customer support for Google Slides. Though I can often find answers to problems by myself online, it would be nice to be able to easily reach out to someone at Google to let them explain it to me. Google Slides has been used by many in my industry and can be effective for just about any slide type of presentation. If you work with many people on presentations, I think this tool can greatly enhance your ability to collaborate with each other. We have used the Google Slides platform to create presentations that have led to successful outcomes. It's a platform that doesn't require extensive amounts of learning time. We can focus more on the content of our presentation and don't have to rely on an IT specialist or graphic designer to put our presentations together. This presentation platform is easy to manage and allows us to stay connected to our presentations regardless of the computer we're on. "A top quality business presentation platform"
I like that this application is part of the Google family of products, which I often use throughout the regular course of business. Like other Google products, Google Slides has a clean and straightforward interface that allows me to navigate through menus and create new presentations quickly. The functionality is very intuitive offering easy import of photos and inputting of text. There are lots of templates on the internet I can use to quickly at least build the foundation for new presentations. Though Google Slides can be used offline, I've found that it isn't quite as easy to use without an internet connection. There tend to be glitches here and there that often make for a less smooth experience. Also, I can only embed videos from YouTube. I can't upload videos directly into my presentation. 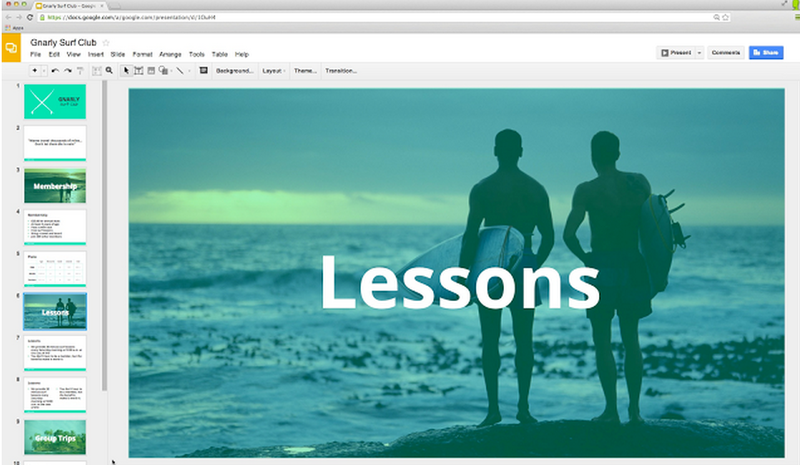 Google Slides is definitely worth checking out for your business presentations and proposals. If you use PowerPoint, you can actually edit your PowerPoint presentations in Google Slides. For easier editing, I would suggest creating your entire presentation in Google Slides from the start. I have been able to create simple and effective slide presentations with Google Slides. Though it's not the most advanced presentation tool out there, it's very easy to use and can get the job done. I have received mostly positive feedback on my Google Slides presentations and have closed many deals using it. It's also a great platform to collaborate with others. It streamlines the process of editing since we can all access the same presentation files online. "Extraordinary web tool created to design slides"
It is very innovative software, which gives you the facility to create important slides through a website, it allows other people, whether they are colleagues from jobs or users to access in real time and work together in your presentations and I like that the system automatically saves all the information, it is also completely free. It is an excellent program, however, there are small details that we must take into account as they are: the internet connection is mandatory and have an account to access this program, is a great disadvantage for those who do not have the same. It is very useful and allows you to create or design presentations quickly and safely through the cloud. It is a secure tool that allows me to create my slides online and store them instantly, it also allows my colleagues to edit and publish the presentations. "Create presentations and share them easily." Excellent tool to organize and create presentations, something I like is that I can access my presentations wherever I go, since it is saved in my Google account, created slides of excellent quality, since I can add animations, effects and everything, from the comfort of a web browser, I can say that its interface is very light and easy to use, which allows me to work faster. Sometimes, adding videos to my presentations is a little slow, as well as uploading large files, I can also say that the animation options and effects are a bit limited, since there are only a few. It is a tool that can help you create presentations; However, it has many limitations, since it is a totally online software, it will depend completely on your Internet connection. I use it daily to organize my presentation files, as well as to work with my colleagues in collaboration in some presentations, Google Slides helps me a lot, since I can work from my mobile or tablet without problems. "Easy to Make Presentations and Excellent Offline Capability!" It's easy to get started if you have a google account, and completely free, so there's nothing to lose. As with all Google apps, what I like best is how multiple people on my team can be working with and editing at the same time. However, more recently I am so impressed with the offline capability of Google Slides and the ability to edit even when I do not have internet access. When making slides to share with co-workers and colleagues, Google Slides is all I need. However, if I needed to create a more advanced and impressive presentation, I'd work in PowerPoint because it does have more features and better templates. It has many (not all) of the features and functionality of the slide program I have used in the past, but with more modern templates and features that you'd expect from google software. It makes it really simple to work with colleagues, especially for remote teams. "Honestly One Of The Best!!!" It is really so easy to use and create the Slides. Google is honestly so smart and I really enjoy using the Google Slides. I find it easy to use, and without much training - it is all very self-explanatory, and if I do want specific training, I can easily find it on YouTube. I enjoy watching the videos and learning. I have even experienced with add-ons and other special features - it is super easy to use and I find my needs being met - for free for the most part! When it comes to the google Slides product i don`t dislike anything!! I recommend using every aspect of Google Slides and watching YouTube videos if you want to learn more. Overall,google slides is one of the best applications in the market for making slideshow presentations! ! ! ! ! ! I realized that i could easilly whip up a slideshow with ease! Developer of softwares and mobile applications. "Organize and create presentations from the comfort of a web browser." Definitely, Google Slides is a very useful tool for my work, since I can create and edit presentations, it contains many sources and I can also add animations, I like it because its interface is very fluid and fast, I can also collaborate as my team in real time , another of its good features is that I can access my presentations from any device with Internet access. The option to work offline is not very good, and I think I should have more animations to add to my presentations because it has very few, another thing I do not like is that their text tools are very limited. Excellent tool you should have in your work, since you can get excellent benefits, it is ideal to avoid having heavy office programs installed on your computer. This software helps me a lot in the office since I can create presentations very fast, it also keeps me organized since I can manage all my files from the same place. Overall, this is fantastic. It's so easy to use and it's doable with just a few clicks of the buttons! I love how fast it is, too. It highly recommend this product to anyone who might use it. With a few clicks, you can easily get a button click and you'll be well on your way to improving your presentation. Tired of not being able to see someone's work easily? That problem is solved when you use this product. You can see updates in real, live-time, and that's amazing. I love how simple the product is. It's great. I wish the templates were easier to adjust and I wish that there were more of them. However, if you need to share a PowerPoint with a large group of people, this is a fast, effective and easy way to do that. I just really wish that there were really more designs and styles. .
Give it a try and be patient with setup, it's great! It's really very worthwhile. I really like how it's so easy to access. Thanks Google. I love presenting with Google Slides. Just a few clicks of a button and I'm in. My teammate and I can be viewing this halfway around the world. It's so amazing that we can actually be working on this at the SAME TIME. It's like, WOW, this is so simple, so easy, why didn't we think of this sooner?
" Great application to create presentations." Google slides is an online application, free, which allows me as a teacher to make great presentations, which serves as an audiovisual resource to support expository classes and motivate students and achieve significant learning. It is easy to use and has an interface similar to the power point. You can use the templates offered or I can simply create and customize my templates, and then add text, diagrams, effects, animations, images and audios on the theme or presentation to be developed. It is also possible to synchronize with other applications that serve as complements to enrich our presentations with images, icons and diagrams, videos, among others. Like other Google applications, it allows collaborative work, so I can create presentations with colleagues or students. It is a great application that only requires having more effects to enrich the presentations. As it is an online application, an Internet connection is required in order to create or edit presentations. 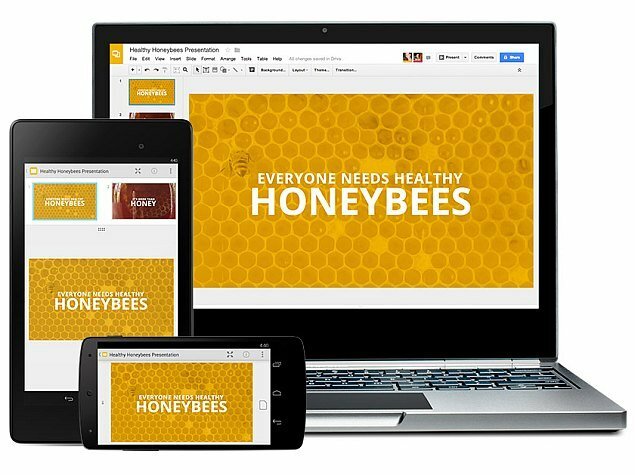 Now you do not have to depend on a memory or computer to save work presentations, with Google slides has everything in the cloud and I can access any computer regardless of its capacity or operating system. "Incredibly strong services in a simple package"
I love being able to easily transfer slides from one presentation to another. That's by far the strongest tool for me. I also love the heads up display when you're presenting, and the ability to get interaction from your audience. Inserting images, videos, graphs and more couldn't be easier, and the benefit of being tied in with Google Drive storage is a major benefit, allowing tons of storage. In the past, some of their updates have broken functions and features, but in my experience they've always fixed it by their next patch. Their support, however, has been terrible. Rarely get a response, though the user communities on forums and Reddit have been much more helpful. Terrific alternative to programs like Microsoft Powerpoint or Open Office. Very intuitive and user friendly. If you -do- have any issues, however, check community boards or Reddit. Google support has been nearly non-existent. That being said, whenever I did find issues, despite not getting a response, the issues did often get fixed within a week. Part of my job as an entertainer is providing visuals. Whether I'm doing trivia for an office party, or a picture slideshow for a wedding, or trying to sell myself to a future client, Slides has been a terrific tool. It allows me to access the files from anywhere, on any device, without downloading anything or installing new programs. No more lugging hard drives and laptops everywhere. "Useful In-Web application for simultaneous group work"
It is so helpful to be able to work on the same document as my coworkers. We are way more able to get things done and complete tasks simultaneously! The presentation mode is also useful. Best of all, it is a free-to-use service! We use this product at least weekly to make presentations and during meetings with our clients. It helps to be able to adjust our document in real time. Also, we can download the presentation just in case there is no WiFi available. It operates smoothly, looks professional, and allows us the freedom to alter the way we present our weekly meetings. Embedding videos is easy, and there are plenty of formats and fonts to choose from. I wish that there was an easy way to play videos rather than using the mouse to hit play. It can definitely disrupt the flow of the meeting. Also, it won't allow for the USB remote to click through after the video has played. The operator of the presentation has to use the mouse to click off of the video, which advances the slide, and then he/she can continue using a remote to advance slides. A great, free alternative to PowerPoint, Keynote, or ProPresenter. We often do presentations on which several people need to work on the presentation at the same time. This program helps eliminate the issues we would typically run into. It saves us a lot of time. "Serviceable application though I prefer keynote"
I like that I am able to convert and play my keynote slideshows. The design of the app is pretty straightforward and easy for a novice looking to create powerpoints. For example, my 5th grade students are able to utilize Slides to make basic powerpoints. There are plenty of templates to use to spice up your presentation and add-on capability adds more versatility to the overall package.The instant save feature is a godsend for those people like myself who have a habit of working nonstop without bothering to save. Digressing back to the keynote conversions. My keynote presentations had a lot of bells and whistles that I spent weeks creating. However, when converted to play on slides, my powerpoints had all the pizazz of a sliding pdf file. I feel that more of a 1 to 1 conversion from iOS/Mac platforms would be great. The transitions between slides are basic and don't really do anything out of the ordinary. Take a look at the Apple's Keynote application, specifically the ideas they have implemented with regards to transitions between and within slides. Basically, spice things up with the main app. No one should have to get an add-on to make the main app better. As I stated before, we have instant access to Google Slides through our school district. Teachers are able to share any slideshows with each other, which is far more convenient than trading stick usb drives. Students are also able to share completed projects a lot easier since it's one universal platform. "Google Slides review 2019 "
The thing that I like the most about this product is that it's a free slideshow creation tool. It also has really solid collaboration tools and an excellent audience question submission tool. It also comes with a tutorial which really makes it easy to learn about and use. What I also love about this product is that you can use it immediately. There's nothing to download as it's online, nothing to pay, etc. As long as you have a Google account, you'll immediately have the features to create and present a presentation in a snap of a finger. This is truly the best free presentation site that you'll probably ever find! Although I enjoy the simplicity of Google Slides, I wish the tool had more complex features similar to other presentation programs. For instance, the animations available on Google Slides are very limited. When I need to make a presentation that requires animations I use PowerPoint or Canva. Make sure you don't need animations that are advanced but you can use scripts to enhance Slides. The ecosystem that Slides uses with Google Drive and other solutions make it easy to sync across teams for ease of use. "Built-in photo editing and masking tools are a real time saver"
I like that I can use Google Slides to mask out photographs, so I can take a portrait picture and mask out the background, and make it really eye popping and impressive for a presentation. It is a Google product and I suspect it is storing personal data from me that I do not want to be stored, and that I want to have the option to be deleted or never stored. I use Google Slides to make visual presentations of information. We have a product we sell that uses a large LCD television to constantly display a presentation, and I often use Google Slides to create the source material for it. I find the Photo Masking tool to be a great tool that is quick to use, and lets me make eye popping graphics by separating background from foreground. "Speaker Notes let you create reminders for when you are presenting"
I like the feature 'Speaker Notes' that lets you write notes to yourself that you can read when you are making the presentation. I make full use of these. I don't like the fonts that are in Google Slides. I like to use Comic Sans and it is not available in Google Slides. I think it is free, I am not sure. Google Slides solves the business problem of creating a digital slideshow when making a presentation. I can create a slideshow and use a template or theme that they supply. There are quite a few styles to choose from. When I am done, I can make the presentation, and the slides appear on screen and I can skip to the next slide by clicking the mouse. The benefits I have realized are all the benefits from making a presentation. We are able to collaborate in real time on presentations. Everyone is able to do their own slides with many different options such as animations, images, and much more. It is an extremely useful tool when making presentations to pitch things. You can easily send a presentation to someone to review it and provide feedback. You can use 3 main collaborator roles. The editor who can edit and make changes to the document. The viewer, who can only see the document. Finally, the commentator who can suggest changes for the editors to approve or decline. You can also set options like allowing or not allowing viewers and commentators to download or print the document. I wish Google would make more themes for its users. There are only like 10 preset themes. I would defiantly sign up. It is free and doesn't require and setup. We are now able to operate at maximum capacity. No more sending the document back and forth to each other waiting for one person to finish their parts. We can now just add everyone on the presentation and everyone can work at their own pace without slowing everyone down. "Flexible, Fast, and Portable - Google Slides is a Winner!" The presentation software does everything you could ask of it, allowing you to integrate content form all of the google platforms, collaborate, modify, and present with no issues. I have had no problems saving or converting across powerpoint files,. I truly have not had a single concern come up that hasn't been addressed through customer support, including the extensive network of user responses on the google support forums. A rock solid option for creating, collaborating, sharing, and presenting, your information. This product works. As an educator, content creator, and education management collaborator, this software allows me to create presentations that can guide the learning for everyone in the building. I use, share, and modify, google slides literally every single day of my professional life because they are EASY to use and work on every device. Giving visible access to students, or non-trusted staff, lets me save the hassle of printing, while still providing access to the key content. "The technology that Google has created helps day by day. " We have had several problems, among them when we want to combine a presentation of Google Slides, with a presentation made in another format. Sometimes the sheets are disoriented and you have to start from scratch. Placing a video is annoying and, depending on your internet connection, the presentation becomes very slow. Editing a document among several people is fascinating, but it can also be very difficult to do, because data can be accidentally deleted. All the information you keep is in a Gmail email account and if that account does not have a good password, someone could erase all that information. The technology serves to facilitate the day to day and make us achieve our goals with less effort. Google Slides is that program you need to use. And if you work in a team, this program will make the work easier to build. Start as fast as possible. In our company we work together with clients. We offer an event service and when we are hired for a party, for example, we build the party with the client. Many times for a celebration clients have asked us for presentations with photos, video and music to honor someone and those presentations are built by our team and customers, online and using Google Slides. This has been very positive and it is quite fun to share with our clients. Google slides is so easy to use and easy to transfer onto other products. If you start with slides and need to download as a PowerPoint presentation, no problem! They don't have many options for styles and layouts, but the ones that they do have are really nice and will get the job done. Keeping it simple. There is only so much you can do with this software, so a simple approach is best. If you need a more sophisticated product, this may not be the one for you. We put together presentations and slideshows for events with Slides. They greatly benefit our organization because everyone can access the presentation at any time and edit i. There is no need to email or download in order to access it, which is a plus for us because we tend to work from several different computers.